It really is so true. 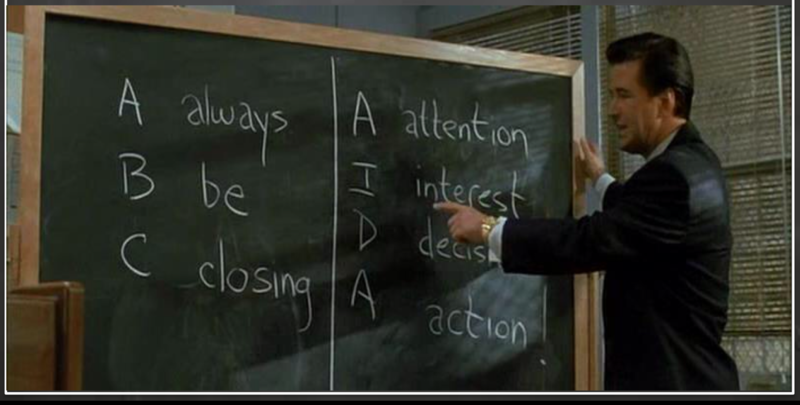 AIDA, or Attention, Interest, Decision, and Action is the best formula you could use for all your marketing. It’s been around forever, well at least over 100 years, so it’s proven. And what’s more it’s barely changed in that time. The AIDA principle is about unpacking what is happening in the human psyche to get someone to make a purchase decision. This is a short snippet from the Glengarry Glenn Ross movie. The full Alec Baldwin speech can be found here (and it’s a ripper!). Ads and Emails. When writing an ad, you must attract the attention of the customer. Use a great image, tag line, heading. Don’t be deceptive but make sure you get that instant attraction of attention. Marketing Campaign. When planning your marketing campaign as a whole, make sure the first piece of marketing that the target audience sees, grabs their attention. It doesn’t have to give them all the info, it only needs to push them to find out more. Website. The main header image needs to be the attention part. A video or beautiful image is key to getting the attention of your target audience. Pique their interest. The headline has got them looking further. Now you need to keep them reading or watching. This is where you need to make that emotional connection with them. DON’T LIST ATTRIBUTES HERE. eg don’t list the features of the home when writing a property ad, or the uses of the product. It is easier to say what NOT to do, as opposed to what to do. This is where a copywriter, advertiser or marketer does the magic. If it was easy everyone would be writing great ads, but they certainly aren’t. It is here you must pose the problem and then your answer to it. Convince customers that they want and need the product or service and that it will satisfy their needs. Ads and Emails. This is where you write the ad to your target audience, providing the aspiration they are seeking. Marketing Campaign. In a campaign this is normally where you send someone to the website and they sign up to the monthly newsletter, or they can pick up the product and touch and feel it. Its a low level interaction with the product or service but it is beginning to answer their questions. Website. This is where you put the primary one or two things that you want the user to click on, and then some information about the product or service. Ads and Emails. The copy needs to spark an intention in which to act. There is no formula to this, but don’t be cheesy. Marketing Campaign. In an entire campaign this is the part where you take the client for a test drive in the car, or emails you in response to the email campaign, or calls you from the contact page of the website. Website. On a website this looks like the bottom of the product or services page. Perhaps it’s the blogs or the examples of your work. But it needs to lead someone to the contact page of the website. Lead customers towards taking action and/or purchasing. This is putting in the ‘call to action’. It is vital that every piece of marketing has a call to action of some sort. Ads and Emails. Simply click here to read more about…, Email to find out more, join our mailing list, go to our website to buy… You know what they are. Be appropriate and relevant. Try to avoid the cheese. Marketing Campaign. If you are Nike or Corona and you have a billboard ad then you are unlikely to have a website or phone number on it. But know that the billboard is only fulfilling the role of Attention and Interest, and perhaps Desire. They are trying to push you to a sports store or pub for the desire and action part. The Call to Action of a marketing campaign is the sales part. Its the email, phone call, or shop attendance to make the purchase. Website. This is your contact page and the contact details at the bottom of every page.